As most of us know, changes are coming to the world of ABA health insurance billing. Four years ago, the industry went through a big transition. For the first time, a billing code set was released that could be used for Applied Behavior Analysis. While the codes released in 2014 posed some challenges, the T-codes have brought us much closer to a permanent code set that must be recognized by all payers. The new codes, released last month, will be effective on January 1st. (If this is news to you, check out this link for background information on the coding changes.) However, this is a big transition for everyone in the industry – both providers and insurance companies. The transition will likely happen at different times for each payer and some may be pretty smooth while others will have lots of bumps. Working with insurance companies is not the easiest or fastest road to navigate. The idea that all of the in-network contracts that providers have obtained – likely through no shortage of frustration and confusion – will now be changing is pretty daunting. But, let’s all remember that we’ve already done this once before when the T-codes came out in 2014. Let’s review what helped providers through the transition last time and get prepared for the work (and bumps) ahead! If you are reading this blog, then you know that a lot of good information can be found through social media. Coverage by insurance for ABA services is still relatively new compared to the greater medical industry, which makes it feel sometimes like information can be impossible to find. Providers, billers, managers, and others in the ABA industry have worked hard to find each other for support. It can be really tough to keep track of insurance changes on your own. If you are not already a member of our Facebook group, join it today! Find other groups that might be specific to your state, or even a specific funding source (for example, some good Tricare groups already exist). Keeping up with social media is also a great way to find out about webinars, trainings, conferences, and other resources. Get connected, and share these resources with other providers or agencies that might not be in the social media loop yet! We are strong believers that there is more than enough business in our field to go around. Whether you are a billing agency, a large therapy group, or an individual provider, it is incredibly difficult to navigate the maze of insurance billing without some help. Especially during a time of significant change, working together will not only keep us all sane, but will help ensure that families are not impacted. You might find help online for big insurance companies like United or Cigna, or you might need to connect, in person, with other local agencies to navigate your state’s Medicaid changes. Hopefully this is a no brainer. New CPT codes aside, the person handling insurance contracts in your organization should always have good relationships with your provider representatives at each insurance company with which you are contracted. Your provider rep will be key in helping you through the transition. Some are more helpful than others, but you still need to keep this contact at your fingertips. You can ask your provider rep when they plan to transition to the new codes, and how the transition will work. If you don’t know who all of your provider reps are, it’s not too late. The new codes don’t go into effect until January 1st, so you have time to hit the phones and catch up with those contacts. Find out which payers plan to transition on January 1st, and you can prioritize your efforts accordingly. We are only partially kidding when we say you need a law degree to understand everything about the contracts with insurance companies. They come with lots of legalese, amendments, attachments, and references to other documents that seem impossible to find. However, for the sake of coding changes, find the section in your contract that discusses how the contract can be amended. Each contract will have a clause that states how much notice the insurance company must give prior to an amendment becoming effective (such as 30 or 90 days). Look for language discussing a “material change” to your contract. These changes require more substantial procedures, and the contract will state how the insurance company must send you notice. If your contract states that amendments must be sent via mail, be sure your mailing address is up to date! Second, the contact will also state how you can dispute a material change if you do not agree with it. If you dispute a material change appropriately per the terms of your contract, then the insurance company will have to work with you to negotiate any terms before making the new amendment effective (this can include rates in your fee schedule). If you must dispute a change through the mail, be sure to send a copy of the letter to your provider representative via email so they can start working on any terms you would like to negotiate. Do the leg work to learn the new codes now. Organizations such as APBA are already providing webinars discussing the format and usage of the new codes. Take the time to learn the codes and get your hands on all available information, such as purchasing the CPT Code book from the American Medical Association. Once your insurance payers start to transition to the new codes, you will want to be educated and ready to discuss any details that will impact your business. Now that you know how to dispute an amendment to your contract (if needed), and once you know the codes, do your own crosswalk to determine what rates the new codes will need to be at in order to be sustainable for your business. If you are not happy with your current rates or have not had an increase in at least the past 2 years, this is a good opportunity to get two things done at once. Work with your provider representative to get the new contract amendment in place, along with new rates. If an insurance company is not willing to negotiate rates or other disagreeable terms of your contract, this may also be a good time to consider leaving the network. Take the time now to identify contracts that are not favorable for your agency and determine what the insurance company must to do keep you in the network. If the insurance company does not hit the mark, then you have an opening to decline the amendment and leave the network. While the new CPT codes go into effect on January 1st, not all payers will be ready to actually launch the new codes on that date. Different payers will transition at different times over the next year. Because the new codes are Category 1 codes, payers must recognize the codes and make the transition (at some point). However, there is no enforcement that the all payers actually be ready on January 1st. Therefore, your billing and administrative teams will need to track when the codes go into effect for each payer and how the differing dates impact your authorizations. When the T-codes were released, it took about a year (longer for Tricare) for all payers that did switch to get through the transition. When payers made the switch to the T-codes, one aspect of the transition that was particularly difficult was changing authorizations for all active clients. Most payers were not able to process both the old and new codes at the same time, which meant there was a hard cut off date to switch from the old codes to the new. Work with your provider representative to understand how the change will take place for your authorizations. Will the payer transition over a six-month period and accept both code sets while the authorizations expire and get replaced with new ones? Will the payer try to crosswalk the remaining units on current authorizations and issue new ones? Will the payer try to make you submit full, new treatment plans to get authorizations with the new codes? Unfortunately, during the T-codes transition, authorizations seemed to be an afterthought for a lot of payers, so we suggest starting early and being persistent in getting answers to these questions. We hate to say it, but the best way to prepare for coding transitions will be to anticipate bumps in cash flow. Again, we learned this during the T-code transition. For example, one of our big payers stated they could process both the old and new codes for that six-month period to make a gradual transition. About two months into the transition, no providers had been paid on a single claim! The payer came back saying they had made a mistake and could not process both codes sets. Bottom line, a major payer did not pay out any ABA claims for over four months despite everyone’s best efforts to be prepared for the transition. To navigate this transition, you need to take a hard look at your finances and be sure you can make it through a cash flow slow down. Remember, if your payers do switch on January 1st, this will also be “deductible season” when many families owe large deductibles, which means even less payment from your insurance companies. Work with your team to determine how much cash you need in reserve to make it through cash flow problems from your biggest payer – probably about two months of cash. If you do not have enough in reserve, now is the time to plan ahead for how you will tackle the problem. Maybe talk to your bank about the options for an operating loan. Or, perhaps you can delay an expensive purchase that you had planned for the end of this year. Either way, discussing this worst-case scenario now will make next year a little easier to navigate. Big changes can be scary, but new coding for our industry is definitely a good change! We encourage providers to get organized, do your homework, and collaborate with each other. Staying in touch through our Facebook group will help you keep an eye on any new information. We also encourage you to join APBA for more great resources. 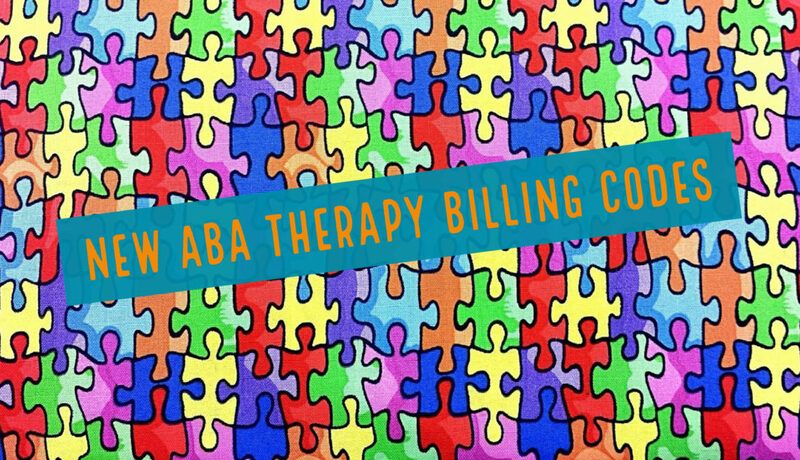 If you have any questions about our services or would like to schedule a consult with ABA Therapy Billing and Insurance Services to see how we can help you prepare for the coming changes, call us at (520) 800-4740 or use our contact or prospective client forms today. We are here to help.